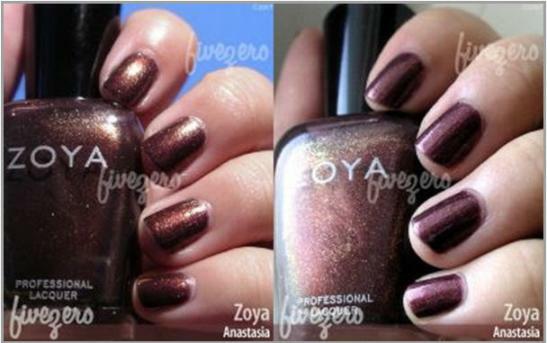 When I saw the bottle, i was 'wow' nice dark purple with gorgeous gold shimmer.. interesting..But when I start to paint it, I could not figure out whether the colour was more to burgundy, brown or purple? I swear I was staring at my nails the whole day trying to figure out the colour.. Very interesting.. This is my nails..Looks like shimmery brown right? But look at the top part of the bottle.. see the purple tone?" Sorry, my camera cant seem to capture the purple tone on my nails. At different lighting, the colour will look different. Enjoy!